Last month the School of Arts at University of Kent issued their first edition of the new Arts Life Student Magazine - this meant I got an article published! 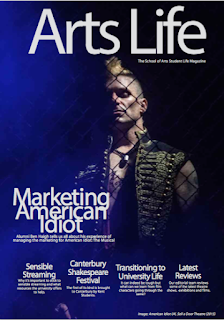 There are so many interesting and useful articles about the Arts and student living, all written by fellow Arts students at UKC. Here's some content from my article! Online shops help you to plan, stay within budget and saves time, money and energy on transport. I mean, your food is delivered directly to your doorstep! It’s a small, yet pleasing luxury. Just remember to shop a few days before your food runs out to save money on delivery costs. Frozen food is not all bad. Buy frozen meat and vegetables; they’re cheaper and last longer than when bought fresh. You can also find the “reduced” section for some cheap fresh produce. Put them in the freezer to preserve them. Don’t be tempted by the on-campus store! We don’t realise until the end of the year that we’ve spent copious amounts on sweets, snacks and alcohol at the on-campus convenience store, so remember to add them to your shopping lists. Live in catered halls? Buy bananas and cereal bars! Let’s not deny that you won’t always wake up for breakfast, so make sure you buy healthy food like fruit and cereal bars to help you keep energised for the day. If your accommodation provides a microwave, you can make scrambled egg in a mug too! Roasts are not just for Sundays! It’s a super easy and healthy alternative to frying, especially for all you chicken-lovers! Defrost some chicken, add a little salt, pepper and rosemary, and roast for 20 mins at 200C. Turn over the pieces and roast for another 20. Do the same to potatoes too! Make some steamed veggies and gravy while waiting for the oven to beep – only takes 10 mins! Voila! Gourmet… well, close enough. Cereal is love, cereal is life. A bowl of cereal is the best lazy morning boost everyone needs. To avoid starving or wasting the limited energy you have on cooking some brekkie, cereal will ease the struggle. Let’s not forget how nice it is as a midnight snack! Fusilli, penne, tagliatelle, spaghetti… pasta is surprisingly cheap despite their fancy Italian names, so having them stocked in your cupboard is always convenient. From cooking a delicious creamy carbonara, to simply adding ketchup, salt and basil, there is so much you can do with pasta – what’s the worst that could happen? Cook excess and store as leftovers. Instead of cooking your lunch the next day, eat your dinner from the night before. Simply reheat and eat. Easy-peasy. Invest in a laundry airer. The launderettes are more costly than you first think, so buying a clothes airer or wash line should save you a few pennies throughout the year. Avoiding the dryers also prevents the unwanted shrinking of your favourite jeans! Mix blacks and dark colours together. If a little bit of sensible mixing saves you time and money, do it. By all means buy colour catcher sheets if you want to be extra careful. As long as you don’t mind mixing with their clothes, you can save money by splitting costs and have quality-bonding time with your housemates with a laundry day! This will also save energy, which is better for the planet – win/win for everyone! Remove the top of a drinks can and place one hole through the hook of a hanger, then place another hanger through the other hole. Gives you more space AND you’re recycling too! Fold the outer thirds of your shirt in so they meet in the middle, then roll up from the bottom and place in your drawers. This keeps your clothes neat, wrinkle-free and easy to find. There are so many other ways to be cost-efficient and healthy while living as a student. To save money on transport, split taxi fares with friends, or simply walk; to exercise without gym memberships, go jogging and breathe in the beautiful countryside air; to avoid pricey alcohol at club venues, have “predrinks” with friends. Remember to take advantage of student discounts; they help make sure your bank account isn’t so exhausted by the end of the year! It’s true that many things are better done with company; cleaning, cooking, exercising, etc. Make use of being around other students and support each other, be adventurous, and learn from each other. Besides, we’re all adapting to living independently together, despite being dependent on student loans and the odd top-up from mum and dad. So if you end up digging deep into your overdraft, remember: you are not alone.